I know what you're thinking - that my game of the week is going to be some sort of manufactured attempt to include god's own county cricket team, Yorkshire, into another article. I resent any sort of insinuation of the kind, I'm almost offended at the thought. I say, almost offended because I do freely admit to occasionally (some would say often) erring on the side of self indulgence and self absorption - but these are my articles which will will appear in my column and also on my blog. So it's my rules, so there. The fact that the game of the week, and indeed the competition so far, DOES include Yorkshire is pure coincidence, cross my heart and hope to die. 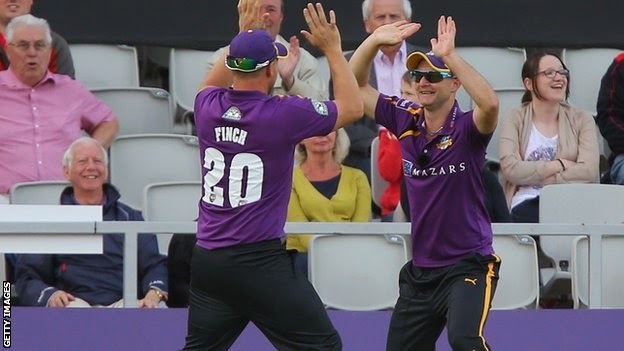 The match on Friday night between the Yorkshire Vikings and the Lancashire Lightning was always going to be a cracker, it's a roses encounter after all. Add to the mix some extra spice of a possible return by a certain Mr Flintoff and the first TV appearance in the Blast of the number one T20 player in the world, Aaron Finch, then it always promised to be good. However, it's safe to say that the match contained far more than it's share of excitement (including THAT catch) and more than a healthy dose of controversy, just to add a little more spice to the proceedings. It was all going swimmingly well for Lancashire batsman Tom Smith as he bludgeoned 55 runs off 28 balls. At this point he produced another big badda boom hit down the ground to make us all believe that he had beaten the field and gone for six, that was until Yorkshire’s Lyth pulled off a simply stunning act of fielding to send a disbelieving Smith back to the Pavilion. Lyth, charging backwards towards the boundary quickly realised that any attempt at catching the ball would see him to fall over the boundary rope, palmed the ball back to the waiting Aaron Finch and the Aussie, perhaps as surprised as the rest of us watching, had the where with all to hold onto to the rebounding ball. It was quite simply fielding of a nature that arguably would never have existed pre-limited overs. It was genius. 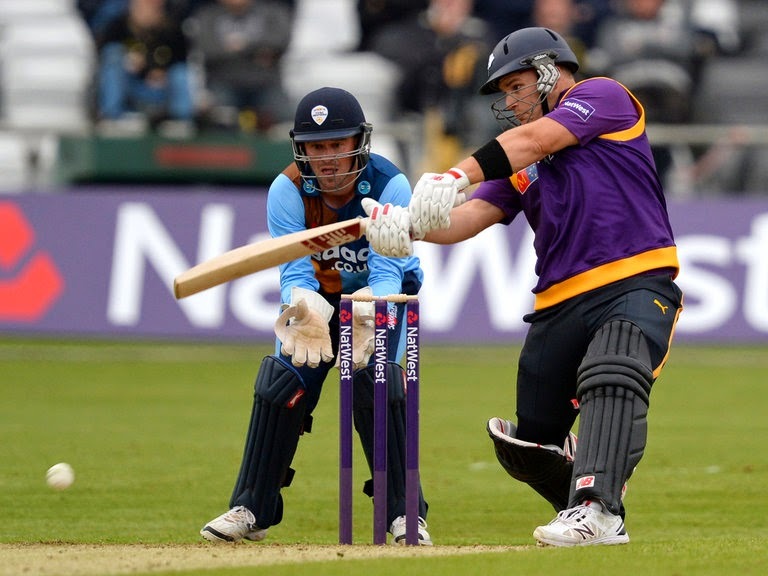 Not content with his involvement in the catch of the season Aaron Finch proceeded to show why Yorkshire had paid the big bucks for the leading world T20 batsman by doing most of the damage with a blistering 88 from 55 balls including four sixes. One of the sixes in particular was perhaps the biggest hit seen at the ground since the big red pillar box was constructed four years ago as the smacked ball hit the concrete above the massive windows on The Point. It was an innings of shear brute force and more than a healthy dose of skill before being dismissed by Tom Smith’s slower ball towards the end of the innings. If that wasn't enough he was then left fuming at the end of this pulsating encounter as Lancashire became the favourites to win as Yorkshire started to well and truly stutter after the dismissal of Finch. It seemed that the final nail in the Vikings coffin had been hammered when Tim Bresnan did his best impression of a lumbering oil tanker when he was run out whilst trying to steal a second run. At this point Yorkshire needed 17 runs from the final eight balls - not necessarily an insurmountable amount in modern T20, but the momentum by this stage was defiantly Lancashire's. That was until the Lancs captain was informed by the umpires that Yorks would be handed an extra six runs due the the slow over rate. CUE much head shaking, hand gesticulating by both the players in red the the majority of the near sell-out crowd. It's safe to say that the locals were revolting, as it were, when the revised score appeared on the big screen. The 11 now needed were knocked off in quick fashion, so much so that we, I mean they, won with three balls to spare when Richard Pyrah launched Kabir Ali over cover for six. I tell you something - if more games are like this one I may yet become a fully fledged convert to the format......but lets keep that between you and me just for the moment, eh? Prelude to the England - Sri Lanka Test series. Would you like that with or without added needle, Sir? Picture the scene. It is the year 1974 and the first Test match in England’s tour of the Caribbean is taking place at Queen’s Park Oval in the Port of Spain. We are nearing the end of the 2nd day and my brave England boys, it’s safe to say, are on the receiving end of a bit an early thrashing, with a 143 first innings lead by the West Indies. A lead inspired in the main by Alvin Kallicharran’s 142 not out. The final over of the day is about to be bowled by Mr Deadly Derek ‘deadly’ Underwood, English off-spinner extraordinaire and apparently a wee bit deadly with the ball, hence his nickname of 'deadly'. As it’s the final over, the players are hot, thirsty, tired and apparently ready to go through the usual end of day motions for the final six balls before heading off for showers, beers and whatever else Trinidad had to offer a touring England cricketer abroad. After all, nobody wanted any controversy so late in the day, right? Well it seems that somebody else had other ideas. A rather uneventful over then indeed proceeded to take place, that is until the very last ball when Bernhard (not sure of his nickname) Julien had offered a tired defensive shot as he gently prodded the final ball away. At this point the England wicketkeeper, Allan ‘knotty’ Knott was preparing to flick the bails off and the backing –up batsman, Alvin ‘Kalli’ Kallicharan, was heading straight off down the wicket. The West Indian batsman was on his way presumably to chat with his partner on the way back to the pavilion about their plans for the evening, or something like that. Crucially, no-one had noticed that the Umpire hadn’t yet had the opportunity to call for the end of the over to signal that play had ended. Well, that is, no-one except Mr Controversy himself, Tony ‘Greigy’ Greig. Greigy Greg immediately pounced upon the ball and in the swiftest of movements threw it and scuttled the stumps at the bowler’s end. Greigy Greig immediately appealed to the umpire, who quite frankly was as non-plussed as the rest of the players as to what had just happened. After a moment of indecision he gave Kalli Kallicharan out, which immediately incensed the player as he stormed off the field, violently throwing his bat to the ground. He must have been angry as he had left his batting partner behind without even arranging which Trinidadian establishment they were going to meet up at for a cola or two. The crowd that had remained were confused as to why he had been given out, indeed many had already left without knowing at all what had happened. As the evening progressed it was abundantly clear that major controversy, and even potential international incident, was developing a life of its own concerning the alleged transgression by Greigy Greig towards the ‘spirit of the game’. After three hours of intense discussion the England powers-that-be decided to officially withdraw the appeal and would ask the umpires to reinstate Kalli Kallicharan. Later that evening, a statement from the English board went even further by offering an apology on behalf of Greigy Greig concerning the affront to the spirit of the game, etc etc etc. Blah blah blah. The simple facts are: Tony Greig broke absolutely no laws of cricket. Kallicharan should not have left his ground while the ball was still live. The Umpires were perfectly correct in giving the batsman out. There should never have been any apology on behalf of England player involved, much in the same way that Harold Larwood should never have been forced to apologise for implementing Douglas Jardine’s Leg theory. Tony Greig himself went to his grave vehemently refusing to personally apologise for his action, believing that under the laws of cricket he was fully entitled to run out the opposing batsman. After all, he was there to win, not to be nice. The man is my hero, simple as that. 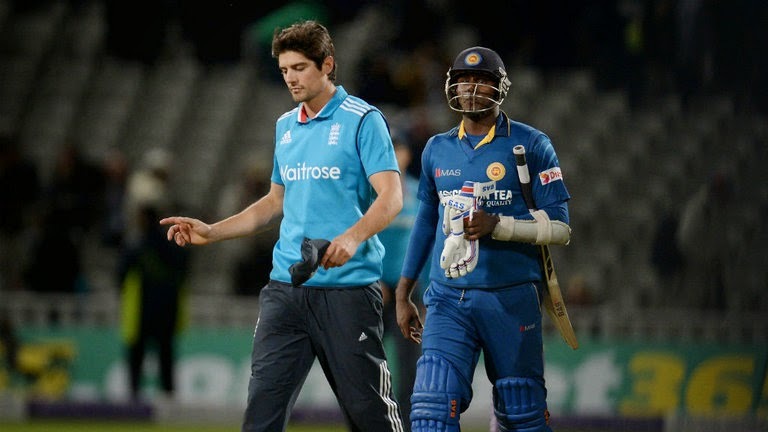 After the fifth and final ODI between England and Sri Lanka this week at Edgbaston, Sachithra Senanayake shouldnt apologise either. Although the 'incident' this week and what took place in 1974 differ slightly in their nature, what does tie the two closely together is that neither actions contravene any laws of cricket. As for the so-called spirit of cricket, please don’t get me started on that. The 'incident' this week was if course the 'mankading' that took place in the 5th and final ODI between England and Sri Lanka. Having been warned twice by the Sri Lankan off-spinner Sachithra Senanayake, for 'stealing a start' at the non-strikers end, Jos Buttler was unceremoniously run-out. Cue much amazement and furore of the England players, crowd and a veritable plethora of ex-players come pundits willing to decry the actions of the Sri Lankans who were vilified for laughing in the face of the spirit of the game. Judging by the groundswell of opinion it seems the outcry was such that I felt sure that the touring team would be immediately be deported and a Royal Navy task force deployed to teach them a lesson in retaliation that they would never forget. Even Mr calm and collected himself, brave captain Cook, exchanged heated words with the Sri Lankan captain as the game finished and then accused the tourists of “crossing the line” for refusing to withdraw their appeal which, yes you guessed it, breached the spirit of cricket. It seems that the fact that removing the bails in such a manner is an albeit rare but perfectly legal mode of dismissal is a mere technicality for some (Yes Mr Vaughan, once again I'm talking about you). However, even though I know that occasionally I can be as blinkered and less than objective about my beloved England team, on this occasion I have absolutely no problem in the Sri Lankans employment of the little used mode of dismissal. In fact I almost admire what they did. Have the vast majority of batsmen had it easy in getting away for too long and stealing a metre or so before a ball is even bowled? Yes. Was it the case that the Sri Lankans may have even purposely targeted danger man Buttler after his one man show heroics in the previous match? Possibly, and I wouldn't blame them if that was the case. Indeed, there is a school of thought that, back in that 1974 Test match, far from being a spur of the moment decision by Greigy Greig, it was a far more pre-meditated decision by the great man to get rid of a batsman that showed no sign of ever being dismissed by conventional means. The simple fact is that Buttler was lazily out of his crease after twice being warned. I can almost hear Greigy Greig chuckling up there at the irony of it all. If nothing else, Mankadgate has meant that an added element of spice has been added to the two match Test series that begins between the two sides on June 12th. In the spirit of such controversy the squad named by England was suitably predictable regarding the direction we intend to play, with no spinner being named and the emphasis being emphatically placed on pace. The noticeable inclusion is that of fast bowler Liam Plunkett, who is in line to play his first Test since 2007 after experiencing something of a resurgence of form at god's own team, Yorkshire. The fact that no spinner was picked might have a little bit to do with us having something of a bare cupboard when it comes to established spin talent, though Monty's ongoing talent for screwing up his cricket career shows no sign go relenting just yet. England also named the uncapped Sam Robson, Chris Jordan, and Moeen Ali in the squad. If nothing else, this blogger was pretty darned happy to see Matt Prior once again included after being dropped during the calamity down under. I for one will be keeping my fingers crossed that Prior can rediscover his best form. Alastair Cook (Essex, capt), Moeen Ali (Worcestershire), James Anderson (Lancashire), Gary Ballance (Yorkshire), Ian Bell (Warwickshire), Stuart Broad (Nottinghamshire), Chris Jordan (Sussex), Liam Plunkett (Yorkshire), Matt Prior (Sussex, wk), Sam Robson (Middlesex), Joe Root (Yorkshire), Chris Woakes (Warwickshire). Angelo Mathews (capt), Lahiru Thirimanne (vice-capt), Dimuth Karunaratne, Kaushal Silva, Kumar Sangakkara, Mahela Jayawardene, Prasanna Jayawardene (wk), Dinesh Chandimal, Rangana Herath, Dilruwan Perera, Shaminda Eranga, Nuwan Kulasekara, Nuwan Pradeep, Chanaka Welagedara, Dhammika Prasad. NatWest T20 Blast - Some random musings. For a number of reasons which I shall not bore you with, there was no cricket blog article last week (and don't think that I didn't hear you at the back saying that I always bore you!). Anyhoo, as usual a few thoughts came into my head this week. Sky television’s obsession with this WASP thing. – I quite like Baseball, though I’ve never been to a live game and quite possibly never will. However I’ve watched many a game on TV and for the most part I enjoy it – I say ‘for the most part’ because if there’s one thing that riles me about US sport is the obsession with all manner of statistical analysis and data. Now cricket has always had it’s own fare share of statistics with batting and bowling averages and the like, and while it’s fun to compare the averages of players past and present , we have never lost sight of the fact that all manner of weird and wonderful things can happen in a cricket match. Quite simply, statistics are not the only thing that we should bear in mind when predicting an outcome of any game, nor should they be absolute and paramount when considering a players contribution to cricket. 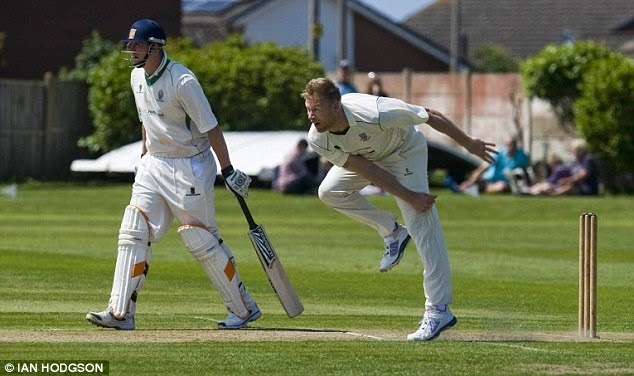 After all, as previously mentioned, while a certain Mr Flintoff's career averages may not be as great as many think they actually are, what cannot be denied are the other elements of genuine box office he brought not just to the game but also to the wider non-cricketing public. However, the constant reference to this newish statistical feature that appears on the bottom right hand side of the screen and constantly changes throughout the team’s innings seems to fascinate the sky commentary team, to the point of obsession. 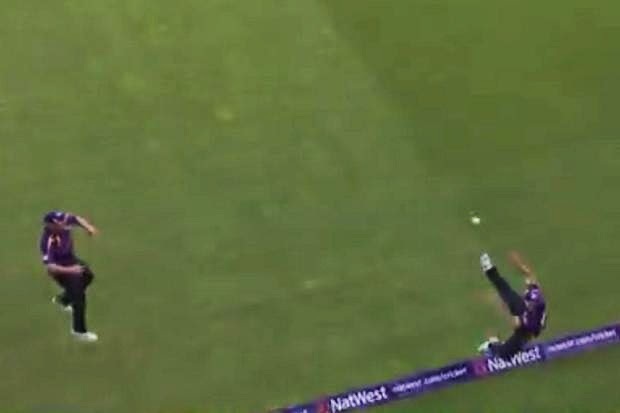 I lost count this week in both the T20 games and the ODI's (and the least mentioned about England's near miss yesterday the better as the pain still hasn't receded) against Sri Lanka, the number of times Atherton, Hussein and the rest of the commentators made reference to this WASP thing. But believe me, it was to the point of nausea - give it a rest boys and just talk about the action for once please. 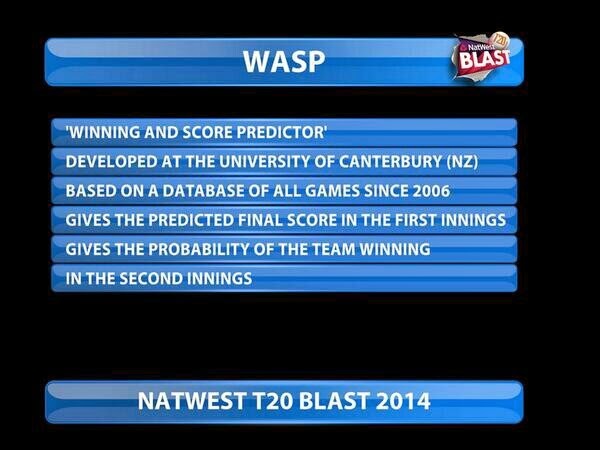 For those of you who are not sure what this WASP thing is, well it apparently stands for Winning And Score Predictor and was devised by researchers from University of Canterbury and using data from limited overs matches since 2006. The system essentially predicts the total score of the team batting first and then predicts the chances of winning for the team batting second. Questions in my head abounded as I watched the games on TV this week; Why they have used the benchmark of 2006 for the data ? What happens if a players retires hurt, then comes back on? And most importantly, will this result in this WASP thing having some kind of fist fight in the middle with Duckworth/Lewis if rain intervenes in the play? This could get messy. Watch those blooming knees, Freddie mate. The return of the Flintoff happened after all, against my advice - though that's not much of a surprise because nobody ever listens to me, not even my dog...... she is anyone's for a biscuit and a quick rub of her tummy.....as am I too, as it happens. The rumours that had been building for weeks, that Freddie was coming out of retirement to return to first class cricket after some five years, were confirmed a week or so ago when he re-signed for Lancashire ahead of the remaining NatWest T20 Blast fixtures. This week he appeared for his old club side St Annes, bowling a total of 12 overs and taking 3 for 36 in a spell that also included five maidens - not bad eh? All was looking good on the comeback trail as spectators of a certain age were taken back in time to rekindle a few past glories? Well not quite, for Freddie's return with the bat wasn't quite so auspicious when he scored just three runs. I just hope that his wonky knees hold out, I really do. Sport is littered with broken reputations of past greats aiming to regain their previous glories and part of me is thinking "don't do it, Freddie!". Though I will readily admit that part of me is also thinking that seeing the man show a little of his old pomp might just further light up what promises to be something of a golden summer. According to the rumours, after training since March with Lancashire he may soon be ready to appear in the Blast, possibly in time for the game against god's own cricket county, Yorkshire on June 27th. Apparently the Lancashire director of Cricket says that he isn't guaranteed a place......yeah righty o matey, we believe you........as do the ticket office and Sky TV. Aaron Finch - one of my players to watch........probably. Which leads me nicely onto the subject of Yorkshire (it's almost if I planned this piece, though those that know me personally would suggest the words 'planning' and 'Stuart' have never gone together in the same sentence - except when the words 'bugger all' are also included, that is). This week saw the Vikings (stupid name) beat the Derbyshire Falcons (a marginally better name) with a rather convincing eight wicket victory to record Yorkshire's first victory in the competition. That was the good news. The bad news was that my predictions, both for individual player, and team performance seem to be as ever, way off the mark. For not only am I still getting my arse slapped in the fantasy league but some of my 'players to watch' such as Aaron Finch was quite frankly was pants on his debut as he fell for just 19. He did score one six though. Big deal. Not yet, KP. Not yet. The subject of Kevin Pietersen is never really far away is it? Firstly, his first appearance of the season for Surrey on the T20 Blast was delayed on the advice of a hand specialist. The rumours that he injured it while throttling a board member of the ECB have yet to be confirmed. Previously his appearances for the Delhi Daredevils (stupid name) in the IPL had seen him playing with a cast on his arm to protect his injury. 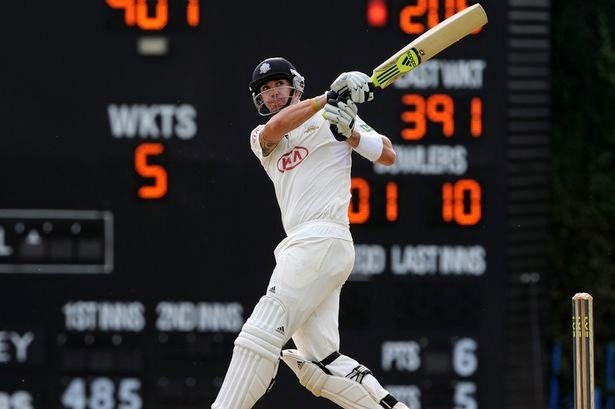 Naturally nothing is ever straightforward in the world of KP, with the Surrey powers that be deciding that risking the wrath of the sell-out crowd was worth protecting him from further injury for a little while yet. If that wasn't enough, we've been treated to yet more unseemly to-ing and fro-ing between the ECB and KP regarding the ongoing fallout from his sacking following the Calamity down under that was the Ashes tour. Earlier in the week, the ECB's managing director, Paul Downton had said on a radio show that during the final Test in Sydney Pietersen had appeared “disinterested” and “distracted”and even suggested that there was nobody within the England organisation who wanted our boy to remain in the team. This drew a number of trademark Twitter remarks and Website statements from KP who angrily denied the accusations. Cue a noticeably speedy apology from the ECB proclaiming 'regret' over the aforementioned remarks. The fact that Downton seemingly had broken the confidentiality agreement which had been brokered between the governing body and KP after the very public sacking of England's leading scorer of all-time across all formats, leaving them wide open to a whole raft of costly legal ramifications, was obviously just a coincidence and had nothing to do with their decision to say sorry so quickly. People who know me will be fully aware of my support for KP as a player. I fully agree that he can often be the architect of his own misfortune with his comments, but on this occasion the ECB really did once again put their put in it.